The Los Angeles Rams take on the Arizona Cardinals at State Farm Stadium on Sunday, December 23 with kickoff at 2:05PM. 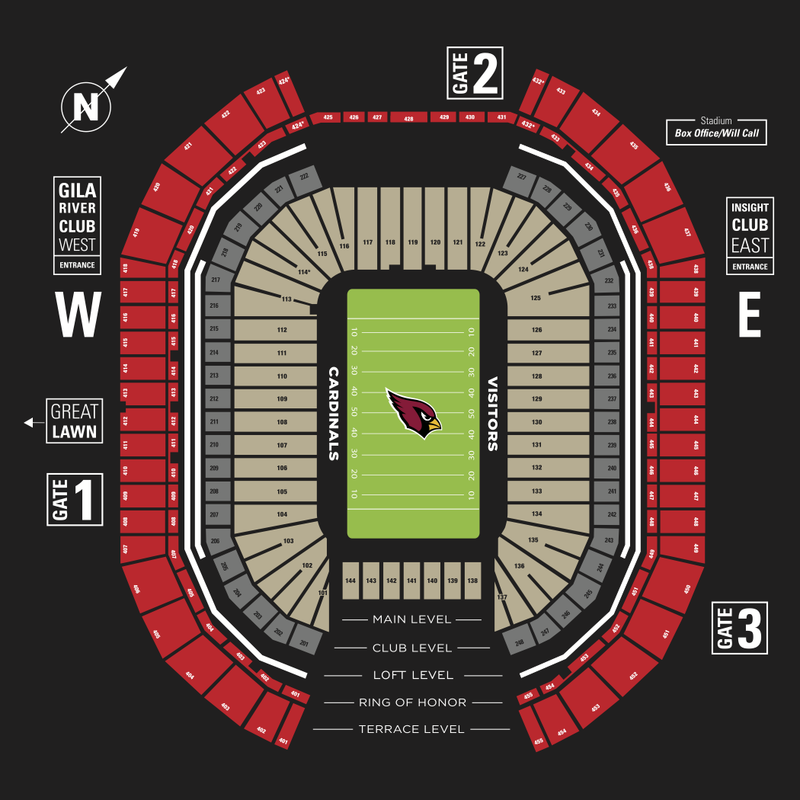 Everything you need to know for attending an Arizona Cardinals game is located in the A-Z Guide. To provide a safer environment for fans and expedite fan entry into the stadium, the Clear Bag Policy limits the size and type of bag permitted. While University of Phoenix Stadium strongly encourages fans to not bring any bags, the following will be permitted. All items are subject to search. One bag of clear bag no larger than 12" x 6" x 12" -OR- a one-gallon clear plastic freezer bag (Ziploc or similar). In addition, fans may carry a small clutch bag or purse no larger than 4.5" x 6.5" with or without a handle or strap. Each ticket holder, including children, may carry an approved clear bag and clutch purse. Diapers and wipes may be carried in a clear bag, however diaper bags are not permitted. Additional clothing, blankets, etc. are permitted but should be carried loosely or in an approved clear bag. Small cameras, binoculars and cell phones may be carried in loosely or in an approved clear bag. For more information on Clear Bag Policy, click here. Prohibited items and items determined to not be appropriate for entry into the stadium will be the responsibility of the ticket holder and cannot be accepted or checked by the Arizona Cardinals or University of Phoenix Stadium. Spectators are urged to secure these items in vehicles or hotel rooms. The Arizona Cardinals and University of Phoenix Stadium are not responsible for items left behind, lost, stolen or damaged. Prior to entering stadium gates, all fans will be subject to a security screening including metal detector screening and inspection of bags or other items carried in. By tendering a ticket and entering the stadium, you consent to such searches and waive any related claims that you might have against the NFL, its member clubs, their affiliates and stadium landlord or their agents. If you elect not to concent to the searches, you will be denied entry into the stadium. On Cardinals game days, parking in Sportsman’s Park is available both ticket holders with pre-sold permits and single event parking. Fans with pre-purchased permits should follow the ingress route located on the back of the pass. Single Game Parking: Single game parking is available only in the Black and Yellow Carparks. A limited number of parking spaces are available on a first come, first serve basis. Parking can be purchased at the entrance to the carpark with cash or credit card. Have payment ready upon entering the carpark. Overflow Parking: Additional parking spaces are available north of Maryland Avenue in independently managed lots. Parking can be found in a variety of lots including both Westgate and Tanger Outlets Center. Hours of Operation: Sportsman’s Park carparks and other Cardinals parking areas open four (4) hours prior to kickoff and close one (1) hour after the conclusion of the game. Please follow the direction of law enforcement as vehicles cannot stage on or block the flow of traffic on city streets prior to the opening of carparks and lots. Vehicles are not permitted to park overnight prior to game day. Parking Spaces: A parking hangtag is valid for one (1) parking space only. Trailers of any kind are not permitted. Parking spaces are available on a first come first served basis and cannot be reserved or saved. Groups that wish to park together must arrive at the same time. Oversized Vehicles: The only oversized parking area is Lot F which opens 4 hours and 30 minutes prior to kickoff. Each oversized vehicle must have a valid “Lot F Oversized Vehicle” parking hangtag for access and is valid for one (1) parking space and one (1) vehicle only. Maximum parking space length is 45 feet. Speed Loading: Fans are asked to follow the direction of the parking team members to quickly park your vehicle. Prohibited Items and Activities: Weapons of any kind, fireworks, unmanned aircraft systems (drones, etc. ), glass containers as well as golf carts, Segways, skateboards, roller blades, bicycles, scooters, hover boards and other non-licensed motorized vehicles are not permitted to be operated. Commercial Activity: The sale of goods or services, advertising or the display of commercial signage on vehicles is not permitted. Vehicles with exterior advertising can be stopped from entering even with a valid hangtag. Also, the placement of flyers or brochures on vehicles is prohibited. Safety and Security: Sportsman’s Park and other Cardinals parking areas are patrolled by parking lot and security team members and law enforcement officers. Tampering or removing of any parking lot infrastructure is strictly prohibited. Traffic Conditions: For current traffic conditions refer to Arizona Department of Transportation. Fan's vehicles that fail to comply with all Parking Guidelines will be subject to tow and all fees associated with the impounding of the vehicle are responsibility of the owner. Hours of Activity: Tailgating activities are permitted from the opening of the Great Lawn and all Cardinals parking areas (4 hours prior to game time) until kickoff only. Tailgating after the game has begun or postgame is not permitted. Parking Spaces: Tailgating in the parking lots must be limited to the area directly in front of or behind the vehicle. Tents and tailgating equipment must not extend beyond the red painted fire lanes, along sidewalks and painted walkways or other areas deemed by stadium staff as an obstruction. Tailgating in empty stalls is prohibited, even with an unused hangtag. Alcohol Consumption: Excessive or underage consumption of alcohol will not be tolerated. Drinking games or any other activity that is linked to competitive or binge drinking are not permitted. Games or activities determined by security staff to be unsafe or which could cause harm to other fans will not be allowed. Grills: Natural gas or propane grills are permitted; however, charcoal grills and oil fryers are not permitted. Tents: Fans are permitted to bring up to a 10’ by 10’ shade tent for use on the grass areas within Sportsman’s Park. So that many fans can enjoy the Great Lawn and south fields, tailgate groups will be limited to one tent. Fans are not allowed to rope off or reserve large tailgate areas on the Great Lawn. Food and Beverages: Fans are limited to preparing/ providing food and beverages for their family and friends only. Private catering companies or the sale of food or beverage items to other fans is not permitted. Unmanned Aircraft Systems: Unmanned aircraft systems (i.e. drones, radio controlled model aircraft, etc.) are prohibited. Possession or operation of such devices will result in immediate ejection from the area and law enforcement intervention. Audio Equipment: Portable public address systems are not permitted and large portable radios and sound systems inside vehicles cannot be used at excessive volume levels or play music not suitable for a public setting (i.e. profanity in lyrics) as determined by parking lot or security team member. Generators: Small portable electric generators (6500W or less) are allowed, however, electrical cords cannot be placed across parking area drive aisles, any sidewalk or create a trip hazard for other fans. Prohibited Items and Activities: Weapons of any kind, fireworks, glass containers, the sale of goods or services, advertising or the display of commercial signage on tents is not permitted. Waste: The Cardinals encourage all fans to reduce, reuse and recycle and dispose of all waste in appropriate waste and recycling containers located throughout all tailgating areas. *Tailgating on the Great Lawn, in Sportsman's Park or other Cardinals parking areas where permitted is intended for ticket holders only and fans are reminded that the Cardinals Code of Conduct extends throughout these areas. The Arizona Cardinals Team Store at University of Phoenix Stadium is open extended hours on Cardinals game days.